V. Padma sits in a chair in her cozy home. Surrounding her is her in-home library: a bibliophile’s wonderland, it holds what many theatre students can only dream of. 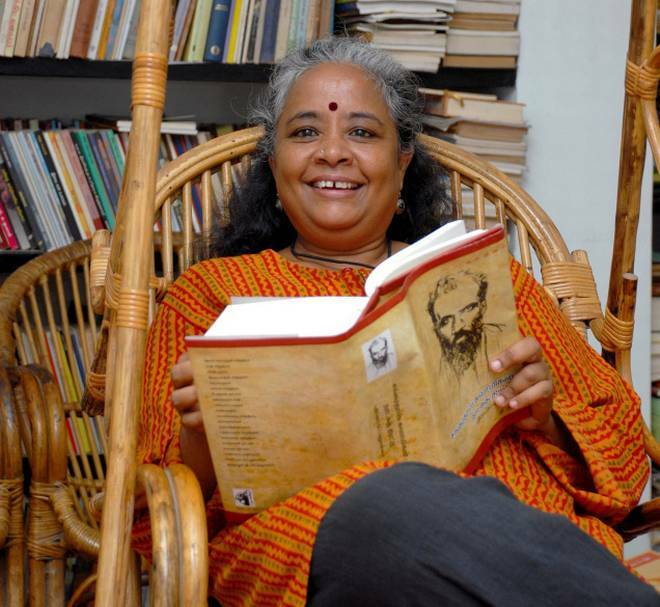 But for Padma, or Mangai – as she is known in the theatre arena – the books represent much more than a petty fascination. They are her life. As a professor of English literature at Chennai’s Stella Maris College as well as one of the city’s most well-known practicing theatre professionals, Mangai is no stranger to either the classroom or the stage. In fact, some say she played an integral role in building it, being one of the first to use her platform to make a statement. “Issue-based theatre, especially that which spoke about gender issues and drew attention to them: well, that’s how I began in the 70s and 80s!” she laughs. Although she was mainly a part of the city’s women’s movement, theatre swept her away in a fury, helping her ‘find her spine,’ as renowned dancer Chandralekha would say. Over the last few decades, Mangai has worked to create positive imagery through her work, even drawing on her background in street theatre through Chennai’s Kalai Kuzhu to formulate her works’ messaging, syntax, and technique. It’s an important thing to grasp on to, especially in a time when contemporary theatre, as much of current theatre is projected as, dominates the performance arena in such a large way. “Many people simply interchange contemporary with modern. But modern is quite relative. If you interpret contemporary to be something more than the literal sense, then I think contemporary will refer to the major anxieties, crisis, and the good things of our times, all of which come to the forefront. Simply put, theatre becomes an expression of dhrishti-kavya: the interpreters are the audience,” Mangai explains. Of course, the clarification elucidates how so much of Mangai’s works themselves operate in the contemporary realm, though they draw from great Indian myths such as the Mahabharata. The space, especially in Tamil Nadu, is one that Mangai ventures into as a recent recipient of the India Foundation of the Arts’ Arts Research Grant. Focusing her research on the analysis of early 20th-century Tamil theatre and its role as a window into the socio-political and cultural landscape of the time, she says the grant gives her the opportunity to delve deep into the history of Tamil contemporary theatre. It’s a first, even for her. “I was a Tamil medium student growing up. So although I have been an English professor by profession, Tamil holds a very special place in my heart. That’s been perfectly multiplied by my choice of partner as well, because Arasu happened to be a Tamil scholar and professor,” she reminisces. As one of Chennai’s few bilingual theatre professionals, the grant allows Mangai to marry her lingual skills with her passion for the proscenium stage to explore long-forgotten vernacular histories. Fascinated by the works of others, from her contemporaries to theatre-makers of the past, Mangai’s IFA grant is only an extension of the love for theatre that has driven her for the last few decades. And yet, ask her about her own judgment of others’ work, and she has this to say. How does she envision that growth? Her answer is simple: dialogue.